Have you read the In Defense of Animals’ list of the Top 10 Worst Zoo for Elephants? Not surprisingly, Oklahoma City Zoo (OKC Zoo) took the top (i.e. : worst) slot for 2016. OKC Zoo has questionable health care, dangerous housing practices, and continues to breed elephants in a herpes virus-infected environment. Bamboo, the last surviving elephant from Seattle's Woodland Park Zoo is still languishing at OKC Zoo. Please email the Oklahoma City Mayor and City Council asking them to stop the inhumane treatment of these endangered animals by closing the elephant exhibit and retiring the elephants to the 2,100 acre Asian habitat at The Elephant Sanctuary in Tennessee. Bamboo and Chai were sent from Seattle's Woodland Park Zoo to the Oklahoma City Zoo in 2015. Poor Chai, who you can see in this video, died within 8 months of arriving at the zoo. She died from emaciation, after rapidly losing 1,000 pounds, and from an infection in her blood, likely caused by 25 puss-filled abscesses—both conditions went untreated! Bamboo, the last surviving elephant from Woodland Park Zoo is still languishing at OKC Zoo. She’s been attacked by the other elephants, and has sustained multiple injuries, including a gash to her trunk and a bite that amputated the end of her tail. As a result, this social creature is frequently kept isolated. Please write a polite but firm email to the Oklahoma City Mayor and City Council asking them to stop this inhumane treatment of elephants. Tell them to allow these elephants retire to the 2,100 acre Asian habitat at the accredited Elephant Sanctuary in TN. The saga of Seattle Zoo’s former Asian elephants, Chai and Bamboo, took a heartbreaking turn when Chai, at only 37 years old, was found dead and alone in the outside exhibit at Oklahoma City Zoo in the early morning of a very cold January day in 2016. Her death came eight months after the harrowing cross-country journey from Seattle to an even colder climate in Oklahoma. The regional and national outcry of unprecedented concern had galvanized the Seattle Zoo to do something regarding its elephants and it was widely demanded - and even anticipated - that the two elephants be retired to a sanctuary. 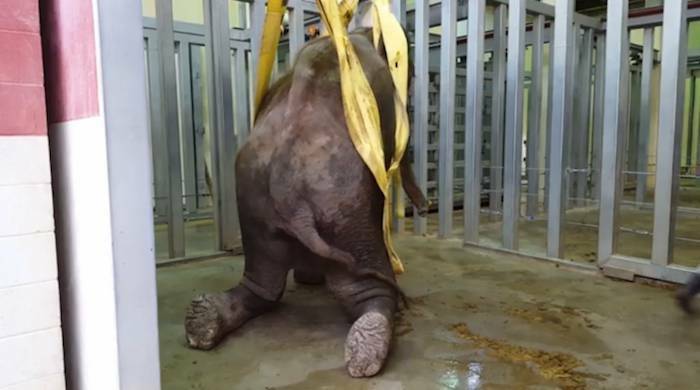 Tragically, the zoo industry failed to act in the best interest of these suffering elephants and shipped the unfortunate pair to Oklahoma City Zoo. Not long after her arrival in Oklahoma, Chai lost about 1000 pounds, and was found on the ground three times in one week. On two occasions she needed to be mechanically hoisted up. She also had a bacterial infection in her bloodstream, likely caused by 25 clearly visible pus-filled abscesses that went untreated, among her other chronic health problems. Yet the Oklahoma Zoo had the audacity to say that there were “no red flags” before her death.